Make improvements to your products and services by collecting data from your customers in an engaging, non-intrusive and cost-effective way. What are SMS Surveys from Esendex? SMS Surveys from Esendex are a fantastic way for businesses to get more information needed to improve customer's experience. By sending a series of questions via SMS, audiences will be able to provide data at any time or place. Senders will also be able to enjoy higher response rates, without the need to send letters or make manual calls. Our online platform makes it easy to design your own intelligent surveys and analyse live results, so that agile business improvements can be made in the fastest way possible. We'll send a text to your phone with a link to an SMS Survey. Finding out how happy your customers are is made easy by sending surveys via text message. You’ll be able to quiz your customers in a way that increases the chances of them responding, and then take an in-depth look at their answers and opinions in an easy to use dashboard environment. You can then make the changes needed to your business, which will help provide better products and services, and keep your customers happy. By sending a series of engaging SMS messages you’ll be able to gain the insight you need from your audience to grow your business. Find out what potential new customers needs and motivations are, identify new markets to explore and measure brand awareness. SMS surveys provide all this by targeting your audiences mobile devices, which in turn ensures the highest response rate, in the fastest way possible. Need to find out how happy your staff are working for you - or would you like to know how they feel about a change to your business? Why not send them a text message survey. SMS Surveys provide an innovative way for businesses to organise events, where each attendee's unique requirements need to be catered for. By sending a series of simple SMS messages you'll be able to confirm attendance and contact details, take menu choices, and arrange any special access requirements your attendees might have. You'll also be able to store all of your attendee's replies to help you organise your event more effectively. By targeting your audiences mobile devices you’ll increase the chances of receiving the feedback you need. The SMS Surveys dashboard makes it easy to view live survey results, and create reports. How do SMS Surveys work for our customers? Boosting Customer Feedback Rates using SMS Surveys for Vaillant Group. Vaillant looked to build on their existing SMS staff communications, by providing their customers with an engaging way for their customers to provide feedback on site engineer visits. 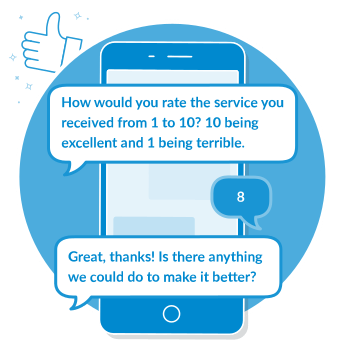 Find out how Vaillaint made improvements to their service by using SMS Surveys. What can SMS Surveys do for my business? SMS Surveys which will help you make faster, smarter business decisions. Here are the features that will help you get there. Our easy to use platform will allow you to start asking your audience targeted questions in a matter of minutes. The Esendex SMS Survey platform allows you to ask questions requiring YES/NO, NPS, and free-type answers. 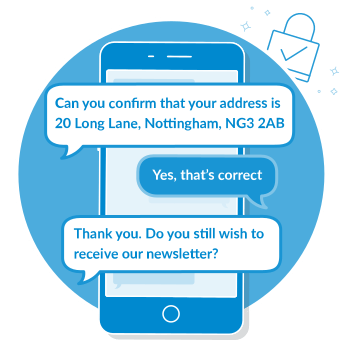 Make surveys more engaging for your audience by personalising them with each recipient’s details. Track how your SMS Survey campaign is performing, and analyse individual responses as they arrive. Ask a series of chronological questions, or ask specific questions based on answers to previous questions. Has your customer completed an action like completing an order? Why not send them an SMS Survey to find out how it went. Want to learn more about SMS Surveys?